Whenyour slice of bread falls on the floor, everyone anxiously looks to see if itlanded jelly side up or jelly side down. Simple probability gives a 50-50chance either way, but it seems more correlated to the difficulty of cleaningthat particular section of flooring. Onspace station the probabilities are still the same, but the results aredifferent. I fumbled my bread after spreading a generous layer of my favoriteconcoction, peanut butter and honey. It sped toward the overhead panel and hitit before I could intervene. Fortunately, it landed jelly side out (it’s interesting how many figuresof speech have gravity-oriented references), so the 50-50 odds were in my favorthis time. Unfortunately, it ricocheted and sped off in a different direction.I noticed that the angle of incidence equaled the angle of reflection. Myearth-honed intuition anticipated a different motion, so I was not able to keepup with the errant slice. Like a real-life version of the game “asteroids,” itwent on to hit a second panel. Jelly side was out again, so the 50-50 statistics were still in my favor. One moretime my hand was lagging the trajectory. Like failing to flip heads three timesin a row, the third collision was jelly side in, which immediately halted all motion. And just like on Earth,the outcome seemed related to the difficulty of cleaning the landing zone.After having hit two easy-to-clean aluminum panels, it landed on a white fabriccovering on a patch of Velcro pile. Thefatalist in me accepts the inevitable Zero-G result of landing jelly side“down,” so I decided to make sure the probability would always be 100%.Realizing that the bread is merely a vehicle for conveying peanut butter andhoney, I decided to spread it on both sides. 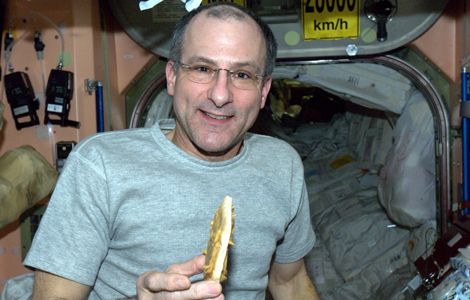 In weightlessness, it’s easy tobalance your slice on its edge so that it can be parked on the galley tablewithout any fuss. And the result is pure tastebud heaven. I do it this waybecause I am in space, and I can. Your story made me smile. Peanut butter IS fun food! Your curiosity totally fasinates me. I so admire people with your level of curiosity. We live in Hillsboro, Oregon so I’m having fun following you on station. We are retired transplants to Oregon from Texas. Our vet tells me when God retires it will be to Oregon and I believe him. It’s hard for me to imagine space could be more beautiful than the Pacific Northwest. Don, I enjoyed your story! Thanks for the chuckle. Thanks Don for enlightening me on the 50-50 rule. I always figured the landing favored the peanut butter side landing on the ground due to its’ heavier weight on that side but maybe I thought that because I more vividly remember the cleanup when it lands face down. Keep up the good work. The space program is always more interesting when you are up there. Wish I was there with you. Hahah! Wonderful post. Perhaps the first time in the history of man that ‘angle of incidence’ and buttered bread were considered together? This post is so fun! I am a 3rd grade teacher and have just finished teaching a unit on space, which included a huge section on NASA history and our flight to the moon all the way to the building of the space station. We live near DC, so we went to Air and Space Museum, had an astronomer who is working on the New Horizon Spacecraft come visit and have downloaded the sightings calendar for the ISS. I will show them this post next week so you may get some comments from 3rd graders! Thanks for all you and the crew do to help mankind learn about science and space. That’s probably the best email I’ve received since months. Thank you for sharing my love of peanut butter and space. We need more stories that end this way. Brilliant! Don, you always make me smile! My husbands favorite food; peanut butter! How fun that you are playing with it in Space. I read your post to my husband, and we both laughed out loud. Life in space certainly sounds messy! It’s clear that part of the specific problem is the brain’s ‘gravitational trajectory prediction firmware’ so you reach for where the toast would be in a gravitational field. Does this change over time so that say after 4 months in space your firmware has self modified, or is the problem just as bad by the time you come to go home? I guess “Murphy’s Law” also applies on the Space Station: If it can go wrong, it absolutely will. Good luck cleaning the velcro surface. Imagine your special “bird face” toast ricocheting and speding off in diferent directions and, at the end, his beack landing on Velcro! Thank you! My toast hit the floor yesterday moring with peanut butter side down. My wife said I was a real rocket scientist. Now I can say I rank right up there with a real rocket scientist – I just didn’t let her see the second slice I dropped too, thank God for my dog. Can you make a grilled cheese with green chili? My mom Anne says hello and I say hello from Santa Fe. I like seeing the videos and the reports of you on the Space Station. I am going to try putting honey on two sides of my bread here on earth. Wish me luck! Hello need anybody to carry your tolls,I wonder what append to the bent or rippel solar panel ,It was repaired with tye wrap ,will tye wrap, plastic made desintegrate because of sunray /radiation.If you can explain I am curious about the law aplied to your toast, weith, friction, velocity are not part of the equation without gravity I must say It is far away that law. I cannot tell you enough what a great laugh your story just gave me and your last words in this post were just… perfect! Part of me envies you guys and part of me idolizes you, but regardless I one day hope to at least get to go out into the vastness of the black. Even if its just for a little bit. Thanks and all the best! Cheers. I am really envious of your discovery. You really do get to eat your cake (peanut butter and jelly or honey sandwich) and the frosting too. Didn’t bread actually land jelly side down most of the time in Earth gravity? It always tends to fall from about the same height, usually by angling off of a surface in about the same way. In all, the outcome has a large Murphy bias. I would like to correct a misapprehension. The odds of toast landing butter or jelly side down are way more than 50-50. There have been studies done, and the typical height of a counter or table top to the ground is enough for only ONE flip of a piece of bread. So if the spread is on the top of the slice in your hand, or on the table top, the piece of bread only has time to flip over once, and land jelly side down. The same principle applies to knife or axe throwing. In order to stick the knife or axe in the target, it has to have the appropriate distance in order to revolve around enough times to present the blade to the surface of the target. On Earth, if you drop a piece of toast from eight feet high, it would typically land butter side up.